Escape to this Luxurious Mountain Condo at Cassidy Ridge - Well-Appointed with Views for Days! It's almost impossible to imagine a place as luxurious while at the same time being so authentic to its surroundings as Cassidy Ridge. From the moment you arrive at the building - with a facade of timber, rust, and river rock that harkens to Telluride's mining heritage - you realize that this is going to be more than a vacation, but a feast for the senses. Views off the private deck with sight lines of the San Sophia range are a visually sumptuous treat any season. The faux fur blankets and rich textiles that fill the home are a tactile thrill second only to slipping into the steam shower or hot tub at the end of a chilly day in the mountains. 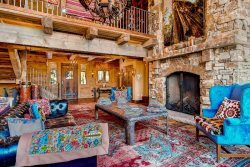 Multiple fireplaces warm your skin while the smell of chili cooking on the top of your Viking stove wafts through the gorgeously decorated living area. Escape from the "touristy" part of Mountain Village and experience something miles from ordinary at Cassidy Ridge. The hosts were great. The views totally breathtaking. The condos amenities were top notch. Coupled with the everyday snow we got during our stay made this vacation a winner. Even though the complex wasn't ski-in/ski-out (as of winter 2019), getting to the mountain was supper easy with the Mountain Village Dial-A-Ride. We will definitely be heading back...just don't 'steal' our week!